'I've got a bad feeling about this,' mutters Indiana Jones from the corner of his mouth. 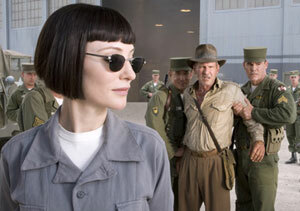 And I must admit, I too had my reservations about Indiana Jones and the Kingdom of the Crystal Skull. 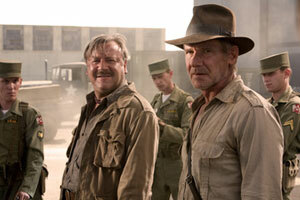 Could a 65-year-old Harrison Ford still cut it as the bullwhip crackin', jaw smackin' archaeological adventurer? And would I at, thirty-cough, really care? Face it, we're none of us as young as we were. But fear not. From the moment the fourth in the Indy trilogy roars into life and our iconic hero tilts his trademark fedora over his brow, you know you're in for a good ol' fashioned, action packed treat. Forget Time Team – archaeology has never been such fun. The year is 1957, the era of nuclear families and nuclear testing, when America rocked to Elvis and rolled over for McCarthy; when hair was slicked back, skirts were wide and Marlon Brandon was still thin, and the most feared creatures on the planet (aside from teenagers) were communists and aliens, the latter usually standing in for the former in popular culture. But in Crystal Skull, hell, with no more Nazis left to fight (they're saving themselves for Hellboy 2), Indy finds himself up against both red peril and little green men. What's more, with dad Sean Connery now out of the picture, who should show up but Indy's long lost son Mutt (a spirited performance from the ever likeable Shia LaBeouf) – yup, in real life we all know Harrison Ford's pulled Ally McBeal, but on screen we're rooting for his reunion with his original Raiders of the Lost Ark sweetheart, the feisty Marion Ravenwood (Karen Allen). With a little help from a gleefully ebullient Ray Winstone and a gloriously deranged John Hurt, our unlikely crew find themselves on the adventure of a lifetime deep in the heart of the Amazon jungle, down white water rapids and into the Lovecraftian megalithic depths of an ancient civilisation, hot on the trail of Cate Blanchett, having the time of her life as helmet-haired military scientist Irina Spalko, a femme fatale comrade in search of occult power from another dimension. But forget the somewhat hokey plot – what Indiana Jones and the Kingdom of the Perspex (sorry, Crystal) Skull really delivers is non-stop, stunt-filled action by the bucket load. True, the joints are a little stiffer these days, and things don't always go according to plan, but then Indiana Jones never was exactly slick, now was he? More a fly by the seat of his pants kinda guy, always in just a little bit over his head, succeeding more by luck than judgment. But it's very sound, canny judgment on the part of Messrs Spielberg, Lucas and Ford that makes Crystal Skull such a resounding hit on the actionometer. Like midlife crisis man on a motorbike, there's something joyously reckless but wryly knowing about Crystal Skull, and although the Indiana Jones series isn't exactly growing old gracefully, it's having a whale of a time trying. Come over 'ere, Tony, I've found something: a follow up film that's actually good.